Big data has been able to predict a lot of useful things over the last few years. Massive quantities of GPS data has given us a handle on what cities have the worst traffic. Millions of online dating profiles give us insight into the attributes most desired in a partner. 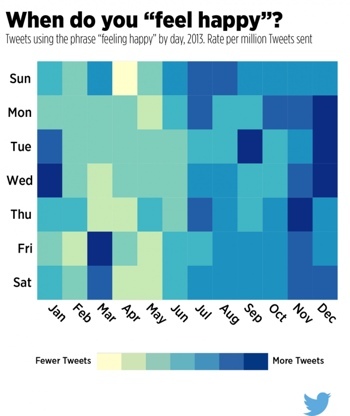 Now, social network Twitter has combed through hundreds of billions of tweets to predict whether you’re likely to be happy or sad based on the day of the week and month. According to the data, people tend to be happier in the second half of the year and at their happiest during the month of December. Holidays and a lack of daylight stirs up negative emotions too – December also happens to be the month people are most likely to feel sad. When it comes to being late for work, no one day of the week stands out. People do, however, seem to develop an affinity for tardiness around the summer months. I’ll leave it up to you to decide whether that’s a consequence of the good weather or from having to deal with the kids being home from school. You can see all of Twitter’s data graphs at the official Twitter blog. For more observations pulled from Twitter data, check out these maps that show how interconnected our high-tech world really is.